Bunuel may have had something there, the apéritif could be an antidote for the rush-rush rat-race of the modern world. It's both a refreshing beverage, and it's the evening ritual of transition. It's a chance to relax and socialize, to share stimulating conversation and prepare for an evening meal. It brings a bit of cafe-culture that is sadly missing for most people's daily life. I am focusing on three recipes that feature a classic Italian apéritif, Campari. This is a good starting point, but you can adjust this at will to suit your taste, the time of day or your current mood. The Americano is like a Campari and soda with a boost. Not as light as the Campari and Soda, the Americano maintains a crispness that serves its purpose well. The addition of the Sweet Vermouth really turns up the tastebuds. It's positively mouthwatering. serve in a highball glass and garnish with an orange wheel. The Negroni is the King of Camparineti. The addition of gin makes this one more of a cocktail than an apéritif, but the bittersweet complexity shines through and manages to pique the appetite. Get some Campari and set out some almonds, make some time, and revive L' Apéritif. Do it this week. Do it again next week. Start a trend and build on it. They say what's old is new again. I am EXTREMELY partial to campari. in all 3 forms you suggest! I am partial to campari myself. I like that it's pink and sweet looking, but that it tastes bitter and bracing. And since gin is my greatest love, the Negroni is one of my most beloved cocktails. I'm a long time lover of Americanos and Negronis, but I've always made them without without soda - just on the rocks. 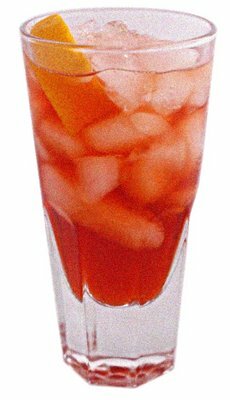 I recently read that some are now making Negronis with champagne or prosecco - I've got to try that! And I always thought that a Campari and soda was a bit too thin - until someone in Tokyo substituted tonic for the soda in my glass - wow.